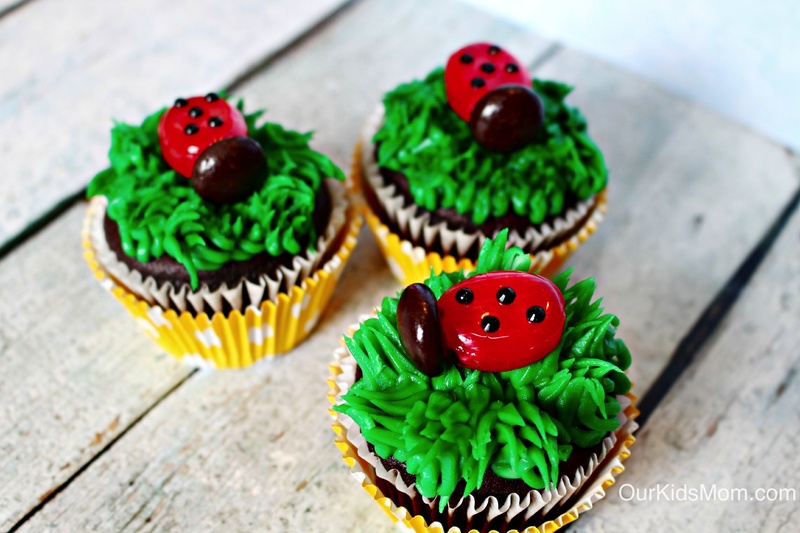 These adorable ladybug cupcakes are perfect for a little girl’s party or just for a fun summer treat. 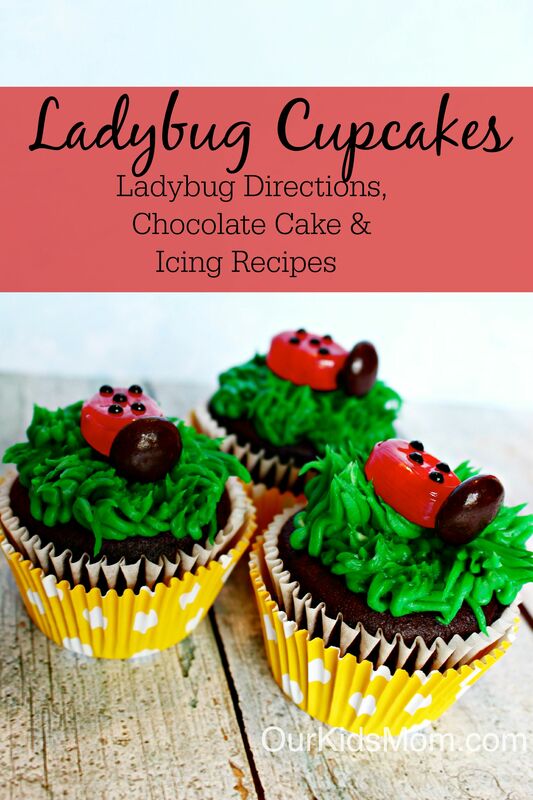 With the right piping tip you’ve got a super quick and fun cupcake the kids will love. We start these cupcakes with a homemade chocolate cupcake recipe. You can, of course, start with a box mix if you’d like. Grease cupcake pan or place cupcake liners in pan. In a medium mixing bowl, add butter and sugar and cream with an electric mixer until light and fluffy. Add the eggs, one at a time and mix until well incorporated. In a separate bowl, sift together the flour, cocoa powder, baking soda, baking powder and salt. Add ½ of the dry ingredient mixture to the creamed butter and mix until just combined (do not over-mix). Add ½ of the buttermilk and mix until combined. Fill each cupcake liner until ¾ full. Bake for 15 to 17 minutes or until an inserted toothpick comes out clean. Let cool in pan for five minutes. Transfer cupcakes to a wire rack to complete the cooling process. 1. Fill 3/4 decorating bag with green icing and attach a Wilton #233 tip. 2. Hold the decorating bag straight up and squeeze to create a glass blade. 3. Immediately after squeezing pull up and away when the icing strand is about 1/2 inch. Stop squeezing and pull tip away. 4. Be sure to keep the strands together so none of the cupcake shows through. 5. NOTE: for a more natural grass look, you can pull the tip slightly to the left or right. 6. Visit Wilton’s website HERE for a video tutorial, if needed. 1. Apply dab of icing to the back of a junior mint candy and press firmly to the front of a strawberry candy piece to resemble the ladybug head. Let set for 10 minutes. 2. Dab little dots of icing on the strawberry candy to resemble ladybug spots. Set for 5 minutes. 3. Place on top of green grass cupcakes. Let me know if you’ve tried any of these ideas or if you have any of your own! These are adorable and perfect for a girl’s birthday party. These look so cute, would love to make some for my daughter. These are very beautiful cupcakes that I would love to make for a birthday party this month. My nephew is having a 3rd birthday party and these would be just perfect for it! What cute cupcakes! To be perfectly honest, though, your chocolate cupcakes by themselves would be a big hit in this house, even without the rich frosting and candy decorations. I’ve pinned it for future reference. Thanks! Very, very cute. I know a little girl who would love these. I love anything chocolate. This will be a winner with me, it is great looking for the kids too. These are adorable. Perfect for spring!